Unibet is probably one of the most widely-known bookmakers in Europe, and has made a very respectable name for themselves over the last couple of years. As one of the largest online gaming operators in the European market, the customer base spans over 100 countries and has over 15 million users worldwide. The Unibet Casinio, official casino of the massive Unibet gaming network, offers a full range of games frpm a number of different slot providers – including NetEnt and Microgaming. The games are all completely instant-play, which means that you can play all of it online and won’t have do download any software to your desktop. 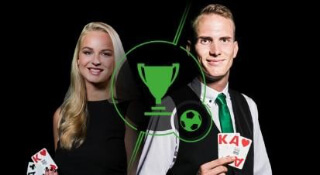 What makes the online casino experience so special at Unibet is because they have brought together a huge range of casino and video slots together, more than 550 of them, with the aim of a smooth and enjoyable experience. With such an extensive range of slots, there are plenty of jackpots for you to win – in slots like Mega Moolah or Mega Fortune Dreams. The site also offers other games – such as sports bets, live casino games, bingo and poker – all on the same site. The diversity of games, and the range of games in the different categories, is what makes Unibet great! When you first register to the Unibet Casino, you will be rewarded with Extra Spins – up to 200 of them. Immediately when you have signed up for an account, you will get access to the first 10. Those 10 Extra Spins, that you get without making any deposits, are valid on selected slots from NetEntertainment. For those who don’t know, NetEntertainment is one of the most prominent slot providers on the market right now – with games such as Mega Fortune Dreams and Starburst in their portfolio. In other words, getting Extra Spins on their slots is a great deal for any player looking to take home the jackpot. But the Extra Spin welcoming offer doesn’t end there. When you have used your first 10 Extra Spins, and decide to make your first deposit – you will recieve even more of them. The amount of Extra Spins that comes with your first deposit will be decided based on the size of the deposit you make. 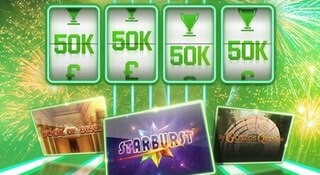 The minimum amount is £10, which will give you an additional 40 Extra Spins to use on selected NetEntertainment slots. The amount of Extra Spins will then vary with the deposit size, up to £100 – which will provide you with 190 additional Extra Spins – resulting in a total of 200 Extra Spins for you to enjoy. Although the welcome offer is great as it is with up to 200 Extra Spins for you to enjoy, it gets even better. When you have signed up to Unibet, you will also get a deposit bonus on the first transaction you make to your account. The bonus is valid for deposits up to £100, and will give you a 200% bonus. This means, that if you deposit £100 to get the full bonus out of the offer – you will recieve £200 extra to gamble with. The £200 bonus and the 200 Extra Spins is the total welcome package if you sign up to the Casino – but you can also choose to get bonuses adjusted to sports betting or poker – with a £30 refund if you lose your first bet, or £20 in poker tickets for free. You get to choose the bonus best suited for you and your gambling preferences. Other than the welcoming offers, Unibet also offer different bonuses in their promotions and campaigns – make sure to keep your eyes open and to stay updated on the site in order to not miss out on any deals! All bonuses comes with the Unibet Terms and Conditions, and are 18+ only. What once started as a sportsbook has evolved to become one of the biggest gambling sites online – with a big range of casino games. The site offers their players nearly 500 different slot games, with titles such as Starburst and Gonzo’s Quest. The slots at Unibet are provided by some of the biggest names on the market – NetEntertainment, Microgaming, Play n’ GO and many more. This gives the casino range a nice mixture when it comes to themes and effects in the games. Since the casino offering is as big as it is, you might feel a bit lost and overwhelmed when first starting of. But don’t you worry – Unibet has a layout which makes it easy to get a full view over which games are popular, new or recommended. You can also try the Unibet Casino out before deciding that the site is right for you, by trying the slots in demoversions without having to sign up. This way, you can make sure that you like the functions of the casino site before signing up and making bets with real money. Like most online casinos nowadays, Unibet is also adjusted work on smartphones and tablet devices for players on the go. Like mentioned before, NetEntertainment is providing Unibet with slots – and they are known for making the best mobile adjusted slots on the market. The games at Unibet will work perfectly on smatphones or tablets, and you will be able to use and access exactly the same functions that you can when playing at desktop. You won’t even have to download some kind of app or client to play on your mobile device, you just open the Unibet website in your browser just as you would on your computer. The site will automatically adjust to the device you’re on – and you can start playing at once. All you need for it to work is a Wifi-connection or internet access, and you can play at the casino anywhere this is available – no matter where in the world you are. If you would run in to any problems while playing at the Unibet Casino, they offer plenty of ways to help you. Directly on the site, there is a FAQ section, where you find the answerd to some of the most frequently asked questions. The Q&A’s are sectioned into different categories, such as “Login Problems”, “Money”, “Bonuses” and others, to make it easy for you to find the answer you need. If you can’t find what you’re looking for in the FAQ, you can get in touch with the support by live chat, phone or e-mail. The average response time is mentioned on the site, and is 45 seconds for live chat, one minute for phone calls and 24 hours for e-mails. The support is open and reachable through the different contact ways 24/7 every day, so that you can get help with your questions at any time. When it comes to payment solutions, Unibet has plenty of different options – you can use credit card, bank transfer, Paysafe, Ukash, Skrill and NETELLER. Unibet themselves doesn’t have any transaction fees for you to consider – but if you’re using credit card or bank transfer your bank might have a fee for that. Withdrawals from the site can be done with the same methonds as the deposits, and Unibet doesn’t charge any withdrawal fees. This means that everything you take out of your account is yours to keep. Since Unibet has a customer base that spans over 100 different countries, the site is available in multiple languages. These include options for the Nordics, Central Europe, Southern Europe, Eastern Europe, the Baltics and Oceania. A daily prize pool of £5,000 is up for grabs at Unibet this month with their Lucky Spin tournament! Unibet's new promotion was so big it had to be split into two - £3000,000 worth of prize draws and weekly tournaments awaits this March! 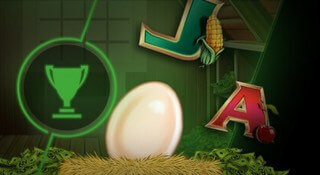 Join Unibet Casino's brand new Beginning of the month tournament, with a prize pool of £20,000! Unibet is bringing you the most exhilirating way of playing casino, and you’ll get to interact with expert dealers in a live environment – with no need to put your best dress or tuxedo on. Live casino games is the closest you’ll get to the real thrill of gambling iin a real casino – and nothing says excitement quite like a live dealer casino game does. At Unibet, you can chat with one of the delightful dealers, watch as she spins the roulette wheel, deal the cards or roll the dice. There is no machines involved in the live casino, everything is 100% real. There are nine different live tables available at Unibet’s live casino – and you can choose between Roulette, Black Jack, Texas Hold’em and other popular table games. As mentioned earlier, there are almost 500 different slot games avaliable at the Unibet casino – so you can easily find hours of entertainment just bu playing in that section. But variation is the key to keep gambling online interesting, which is why Unibet offers a wide range of other online games as well. As you know by now, there is a live casino available at Unibet, where you can play live versions of Roulette, Black Jack and other table games. But if you prefer, you can also find versions of the table games in the regular casino section as well – if you don’t feel like live casinos is your thing. You can also find a Bingo-, a Poker- and a sports category on the site. All of them have a big selection of games and bets for you to choose from, to make sure that your gaming experience won’t ever get dull. Just as most corporations in the online gaming industry, the Unibet headquarters are located in Malta. Unibet International Ltd, who runs both Unibet and Maria Casino, has a license issued by the Lotteries and Gaming Authority (LGA), which is a public regulatory body which is responsible of all forms of gaming based in Malta. A Maltese license means that winnings on the site is tax free fpr all EU citizens playing within the EU – which can be a good thing to know. When choosing a casino to start playing at, you should always make sure that it is propely licensed – since it means that the company is running a serious gambling business, and that players can feel secure when playing at the website.